Recently, I viewed three art shows in quick succession, which heightened my awareness of these mental shifts as I traveled from one artist’s world to another. The things I like most about travelling to new destinations are that I don’t know what to expect and that I have to learn how to navigate through a different language. Maybe that’s why I love going to new art shows: there’s a strong sense of anticipation about what I’ll discover accompanied by the knowledge that I’ll have to temporarily drop my own familiar idiom to respond to the invented vocabulary of a complete stranger’s. 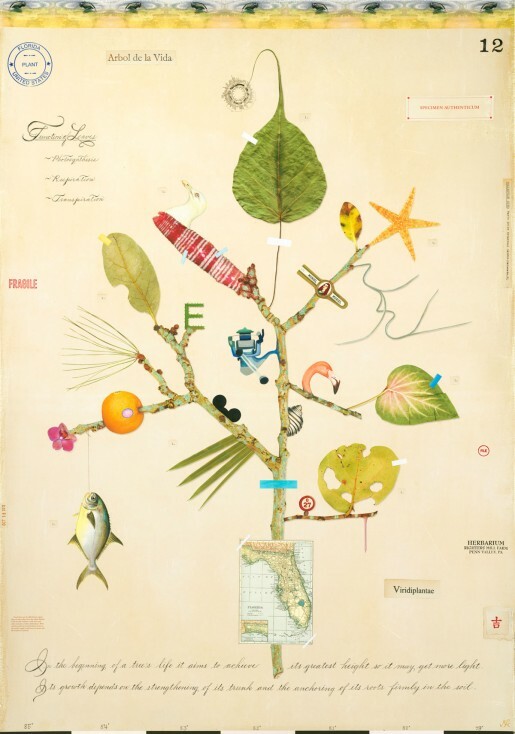 Take the leafy lexicon of MF Cardamone’s exhibition at the Selby Gardens Museum of Botany and the Arts, “Florida Fantastica, “ inspired by pressed botanical specimens found in academic labs and natural history museums. Traditional pressings and botanical illustrations are beautiful but can be a bit repetitive. 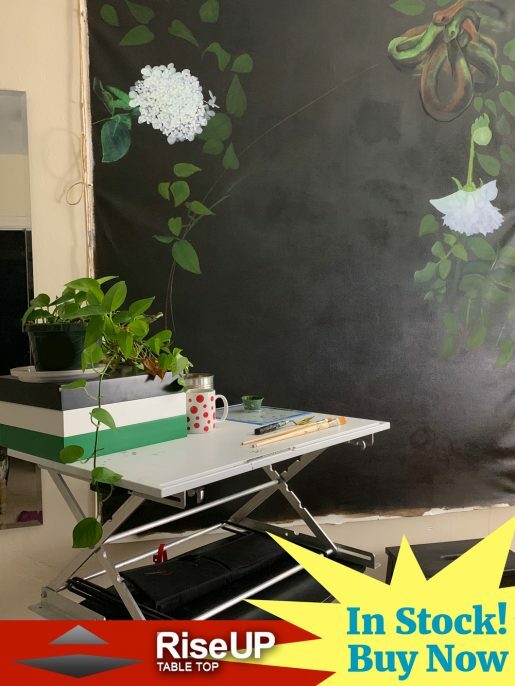 In start contrast, Cardamone’s mixed media works take that style of predictable plant and flower portraiture and blow our preconceptions away. There is always a bow to original botanical illustration and specimen mounting concepts in her work, seen in the appearance of some part of a flower or plant, accompanied by educational descriptions in elegant, cursive print. However Cardamone’s unique and beautiful interpretations of her subjects include personal references infused with such original wit and whimsy, accented with intermittent touches of the surreal, that they surprise and delight while remaining informative. There were lots of smiling viewers around me: Is that a sumac frond playfully soaring like a decorative feather from the top of a 19th century woman’s hat, upon which is perched… a bird? Yes! Cardamone’s art is humorous and idiosyncratic, with every clever image intelligently rendered with fastidious attention to detail. After spending time with the captivating, intricate work sprung from Cardamone’s abundant imagination, I headed towards the Selby Gallery at Ringling College of Art and Design. There, my mind traveled from visions of botanical splendor to the spare, celestial elegance of the installation, “Phases of Identity” jointly created by Carol Mickett and Robert Stackhouse. The installation sprawls through two galleries. What struck me first was the open, crisp, very white space that feels like an invitation for the viewer to enter. You can’t resist a stroll through the large wood sculpture. “Breath of Water,” has long slender strips of white paper vertically strung throughout, which shift gracefully in response to the surrounding air movement. 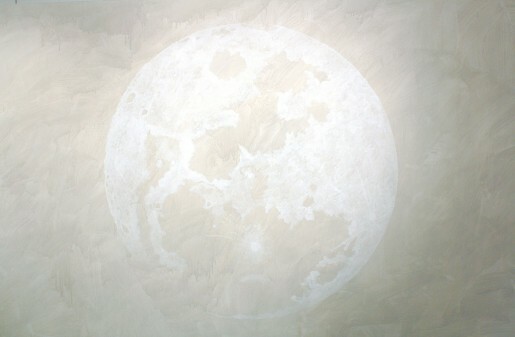 The sculptures’ wall shadows, like visible echoes, extend the sense of the sculptures broad expanse. The interplay between the installation’s elements, how the objects, viewers and context relate, conveys the artists’ interest in identity. The idea being, that we exist and are defined, in relation to each other. This made me think about how often in everyday life, we mistakenly think that we act alone and how we conveniently forget our actions have consequences. Rather than look at the art in this show, piece by piece in sequential order, as people often do at galleries, this installation encourages viewers to move around at will and create personalized connections and interpretations of the entire experience. 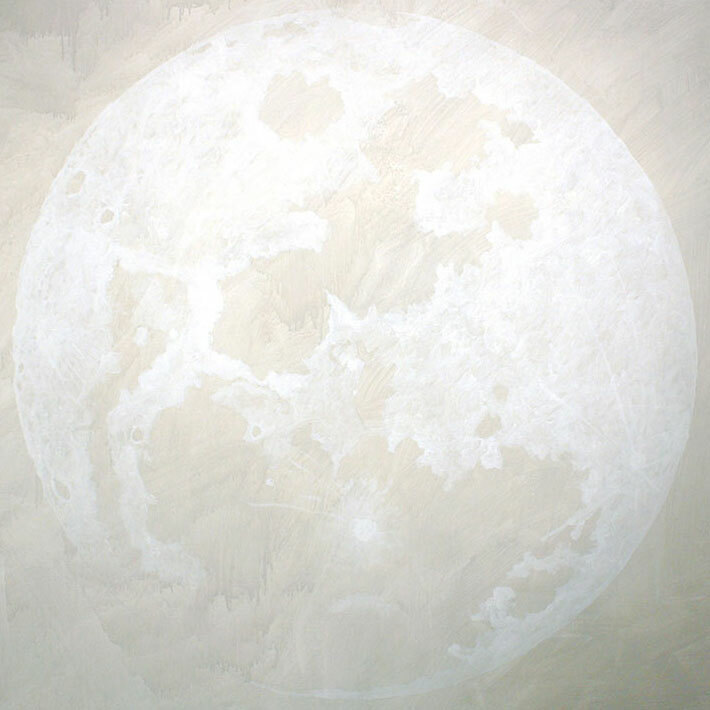 The show is a symbolic reminder of the intersection between individuals and their surroundings that leads to a collaborative understanding of one another. I had a little time left in my day and needed some head clearing. At these moments, I usually go to the Ringling Museum and pick a gallery to explore, or grab a bite on the beautiful terrace of the restaurant, Treviso, which always makes me feel like I’m on vacation. Sometimes I even take a ride on the trolley, for no reason at all—just to see the incredible grounds of the museum again, in a fun way. The friendly volunteer drivers know me there by now. “The Greatest Show on Earth,” a mural by William Woodward. Photo by Giovanni Lunardi, courtesy of Ringling Museum of Art. But this time, I had the perfect conclusion to my art-filled day: visiting “The Greatest Show on Earth,” the recently installed mural in the Circus Museum’s Tibbals Learning Center at the Ringling Museum, painted by William Woodward in 1990, of the Ringling Brothers, Barnum & Bailey Circus. This forty two feet long by twenty two feet high oil on canvas was donated in 2012, when the corporate offices of Feld Entertainment, the parent company of Ringling Bros. and Barnum & Bailey, moved to the West Coast of Florida from Virginia, where the mural (commissioned by Feld’s CEO, Kenneth Feld,), had hung in the lobby of the corporate headquarters for twenty-two years. The mural is right at the TIbbals’ entrance and causes energized and joyful commotion. I pitied the poor guard who valiantly tried to keep children and adults alike from using flash cameras. 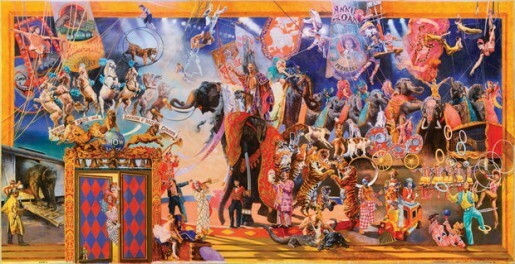 Frankly, when faced with a spectacular, huge, riveting, richly rendered, colorful and descriptive circus themed painting filled with detailed depictions of forty-five performers, mid-performance (including Dolly Jacobs, Gunther Gebel-Williams and Frosty the Clown among many others), twelve elephants, eleven tigers, one unicorn and seven banners, if your response is muted and disinterested, then you’re better off staying in the Netherworld from whence you came. As for the rest of us, standing before this mural feels like you’ve been dropped into all three rings of the circus at the same moment. It’s exhilarating and a sensational way to begin a tour of the Tibbals, a center devoted to circus life. My art travels began at the Selby Garden museum’s excellent exhibition “Florida Fantastica,” where I romped around Cardamone’s witty botanicals that turned my expectations on my head. I won’t be looking at flowers and plants the same way anymore. Then I continued on to Mickett and Stackhouse’s cerebral and interactive elegant white metaphors for the multi-layered connections that can define identity. I left the gallery with their message about the illusion of autonomy incorporated within me. Finally, I ended up with a jump into the world of circus magic through Woodward’s new mural at the Tibbals Learning Center. This painting serves not just as a joyous outsized celebration of the circus, but its permanent home at the Ringling Museum is a perfect reminder of the unique relationship between the Ringlings, the circus and Sarasota. Even as an ex Northerner and fairly new SRQ resident, I felt quite proud of our rich and eccentric history. Great article, and very informative. We are very fortunate to have such a knowledgable art writer. shows how the artist’s imagination unites us all. so different and so nourishing and such a great writer that makes as think about them!